Twenty-five years after the terrible violence and genocide in Rwanda, we look back on our view of the events, when we were often on the frontlines, and the assistance our teams were providing at the time. From early April 1994, Médecins Sans Frontières (MSF) teams witnessed and faced extreme violence in Africa’s Great Lakes region, which covered Burundi, the Democratic Republic of the Congo (then known as Zaire), Kenya, Malawi, Rwanda, Tanzania and Uganda. The violence included the horrific genocide of Tutsis in Rwanda. During the period of 1994 to 1997, Médecins Sans Frontières teams providing assistance against a background of extreme violence and wholesale slaughter in the Great Lakes region found themselves faced with a succession of unprecedented situations. Before then, the teams had been mainly deployed in refugee camps and health centres some distance from the fighting and massacres. As the genocide against the Rwandan Tutsis was set into motion, MSF’s teams in Kigali and other places across the country witnessed the first executions. Almost 200 members of Médecins Sans Frontières’ Rwandan staff were murdered, some of them in front of their colleagues. When the MSF teams finally succeeded in assembling the resources required for an aid operation—in this case a surgical programme—patients were either killed before their very eyes or a few hours after they left. These were the many issues the Médecins Sans Frontières teams had to grapple with, as much in the field as during the internal discussions which gripped the whole organisation. 6 April: Airplane transporting Rwandan President Juvénal Habyarimana is shot down, triggering the genocide against the Tutsis. 22 April: MSF condemns withdrawal of UN peacekeepers (UNAMIR) from Rwanda. 18 May: MSF appeals to the French authorities to exert their influence on their Rwandan allies to put an end to the massacres. 24 May: MSF provides testimony to the United Nations Commission on Human Rights on the genocide being perpetrated in Rwanda. 18 June: MSF calls for UN armed intervention against the perpetrators of the genocide. 23 June: France and its allies launch Operation Turquoise in Rwanda with a UN Security Council mandate to intervene militarily between the belligerents—but not to confront the perpetrators of the genocide. 4 July: The Rwandan Patriotic Army (RPA) takes Kigali and Butare. 13 July: Several hundreds of thousands of Rwandan refugees arrive in Goma in Zaire. 27 July: 20,000 people in camps in Goma die of cholera. 30 September: MSF international personnel threatened in Katale camp in Goma and MSF evacuates its teams. 18 November: MSF’s French section withdraws from Rwandan refugee camps in Zaire. December: MSF’s last remaining section withdraws from Rwandan refugee camps in Zaire. 18 October: Alliance of Democratic Forces for the Liberation of Congo-Zaire (AFDL) becomes official. Laurent Désiré Kabila is spokesperson. 26-27 October: The RPA attacks Kibumba and Katale Rwandan refugee camps in North Kivu. 31 October: The RPA and AFDL take Goma and MSF evacuates our teams two days later. 08 November: MSF calls for civilian protection zones and international military intervention. 15 November: The RPA attacks Mugunga camp in Kivu. Between 400,000 and 700,000 refugees flee to Rwanda. 15 December: MSF provides assistance in Tingi-Tingi (Zaire) where almost 70,000 refugees have taken refuge. 07 January: Death rate stands at 50% for children under the age of 5 years in Tingi-Tingi. 07 February: Given the proximity of the frontline, MSF is no longer present on a permanent basis in Tingi-Tingi. 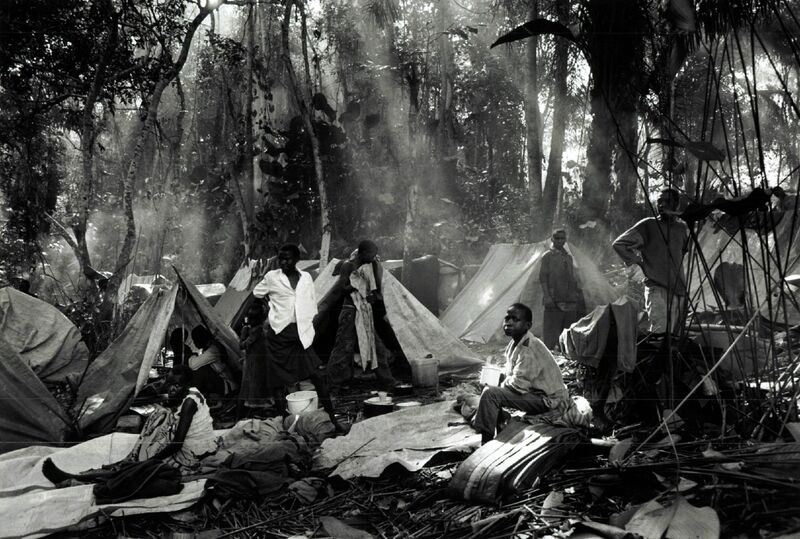 02 March: The RPA and AFDL take Tingi-Tingi and 160,000 refugees flee. 15 March: The RPA and AFDL take Kisangani. Humanitarian aid organisations, including MSF, had pulled out two weeks before. March-May sees a succession of massacres perpetrated against fleeing refugees between Kisangani and Mbandaka. 20 May: Media publishes extracts from an MSF report denouncing the disappearance of 190,000 Rwandan refugees in Zaire. The departure by the first MSF teams evacuated after three weeks for the airport in Kigali, Rwanda, April 1994. Kigali, April 1994. A patient and his brother who accompanied him to the MSF/ICRC hospital in Kigali. Despite intense discussions with the colonel in charge of the zone where the hospital was located, the MSF team could not convince him to accept the presence of the patient&apos;s brother at the hospital and demanded that he leave. He was killed 100 metres from the hospital. Rwandan refugees heading towards North Kivu and South Kivu, Zaire (now DRC), July 1994. 13 April, 1994. Rwandan refugees at the border between Rwanda and Burundi. Rwandan refugees wait for aid in a camp in Goma, Zaire (now DRC), July 1994. A crowd of Rwandan refugees waits for assistance, Goma, Zaire, July 1994. A group of Rwandan refugees in Goma, Zaire, July 1994. As a result of heavy fighting, a million Hutu refugees flee, with 2,000 leaving on an overcrowded train travelling from Biaro to Kisangani. On arrival in Kisangani, it emerges that 100 people have died during the journey. A woman with her baby grieves over a family member who died. DRC, May 1997. The AFDL considered these people enemies, and our teams assisting them belatedly became aware of a deadly plan in the making. In April 1997, the soldiers were not only killing refugees on a massive scale but were also using humanitarian aid organisations as bait to entice them out of hiding. Some camps, such as Biaro, were emptied. When the humanitarian organisations were able to access them again, there were only a few survivors among the corpses.